The longest and one of the best-attended Western Weekend parades in years enjoyed blue skies and warm weather Sunday. There were, in fact, so many parade entries there’s room for only a sampling of their pictures here. 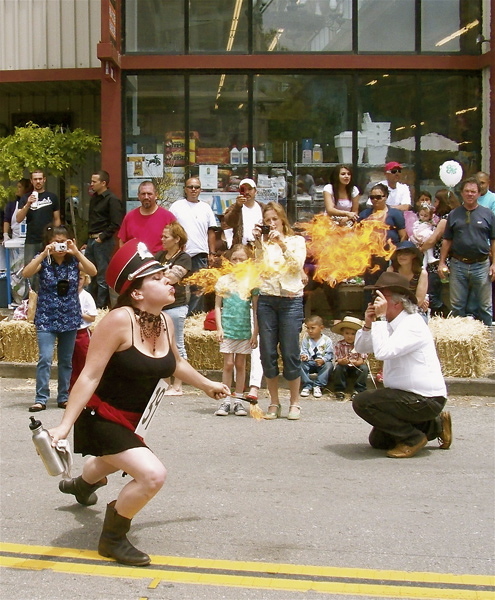 In undoubtedly the most impressive individual showmanship, Bonnie Porter of Inverness blows a kiss of fire. In her day job, she’s a computer techie. 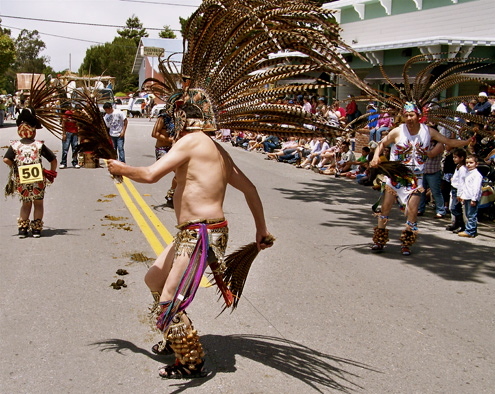 The Aztec Dancers keep rhythm with the beat of a drum (next to centerline at rear). 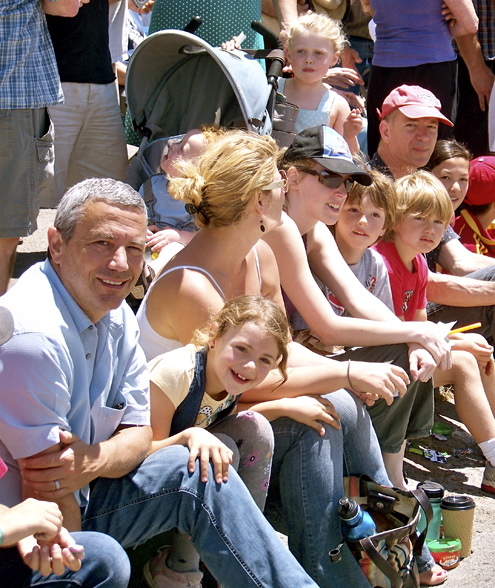 Going to the parade as a family has a long tradition in West Marin. 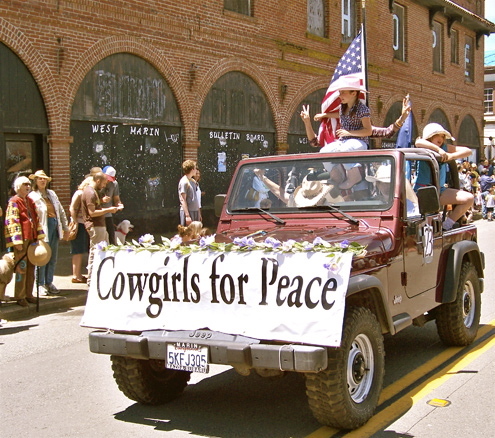 Progressive politics and the Old West combine each parade in a Cowgirls for Peace entry. 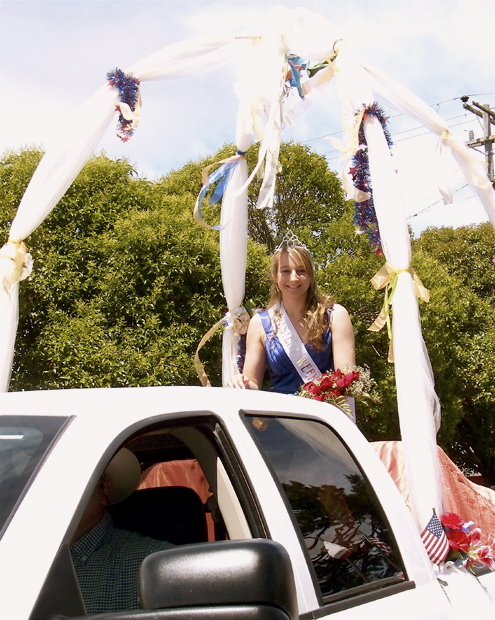 Western Weekend Queen Ashley Arndt rides in a royal coach. 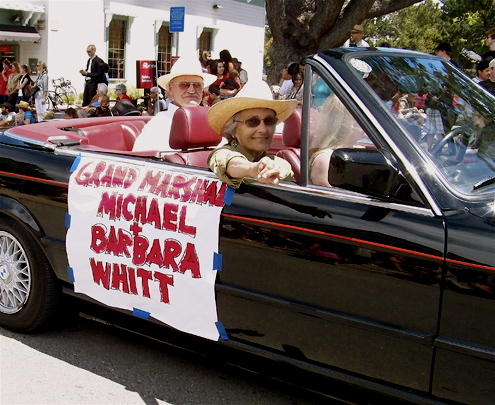 Barbara and Michael Whitt were parade marshals this year. Dr. Whitt has been a family physician in Point Reyes Station for almost 40 years. 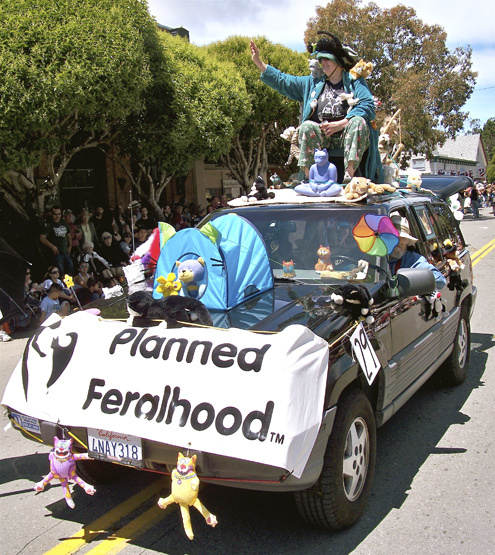 Planned Feralhood’s entry with director Kathy Runnion riding on top, along with an assortment of feline ornamentation. The group catches and sterilizes feral cats, then returns them to their colonies and feeds them. Planned Feralhood also maintains a shelter in Nicasio, where the most problematic cats are kept, but that shelter has until June 30 to move. It is looking to rent a spot that includes space which can be enclosed. Living space for two staff would be especially helpful, as would contributions to help pay moving expenses. For more about this please see my May 27 posting. 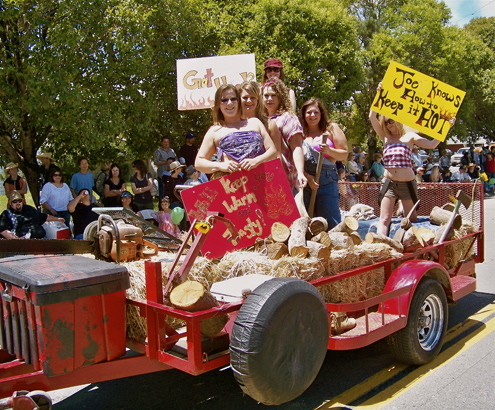 Grand Prize-winning float. 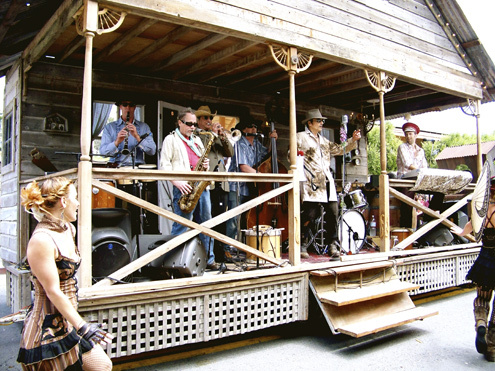 El Radio Fantastique performs while rolling down the main street in a cabin on wheels. 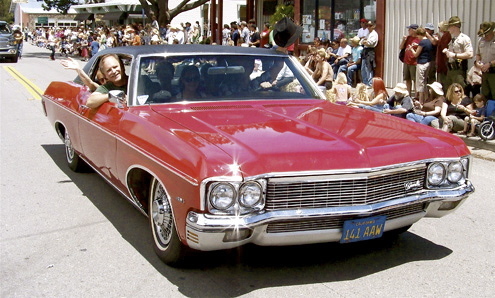 Point Reyes Station Realtor Fred Rodoni Jr. rides in his late father’s 1970 Chevrolet Caprice. Dancers having fun on an entry advertising Very Nice Firewood of Point Reyes Station. 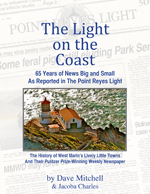 In the early 1970s, an official from the Italian Consulate in San Francisco complained to parade organizers, the West Marin Lions Club, that the patrol disparaged Italians, what with its seemingly confused marchers colliding with each other and going off in all directions. Defenders of the patrol replied that many of the members are of Italian descent. Nice post! Great set of pics too. But where are the photos of the horses? They’re my favorite of a Western Weekend and they amaze me with their unbelievable calmness in all the clamor. I think most parade-goers don’t realize what incredibly great horses they have to be in order to tolerate a parade. My horses would just need one look at that crowd, the loud marching bands, the vehicles that sometimes backfire and all that crazy energy and they’d be outta there soooo fast they’d be one big blur. Here’s to the fabulous parade horses of Western Weekend and everywhere! Really great stuff Dave as per usual. I need to catch up on some other posts too. I am a past princess for the Western Weekend, and this is bringing back all those memories from 1971. Thank you to the West Marin Lions Club. I will never forget all you did for me. Great job on the pictures. I really miss California, but the photos bring me back. Thanks! Western Weekend may always have been a family affair, but for us singles in the 70s, the weekend was a rambunctious, freewheeling affair. Some establishment-types eventually suppressed the rowdy aspects of the weekend, but while it lasted, Western Weekend of that time provided fabulous memories! Went to western days last year for the first time–what a kick!! enjoyed it so much–when is it this year? 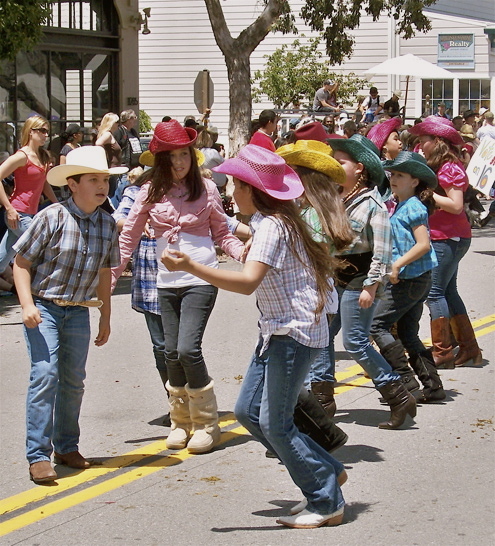 The Western Weekend Parade is always the first Sunday in June, which this year will be June 5. Sparsely Sage and Timely is powered by	WordPress 4.9.10 and delivered to you in 0.712 seconds using 56 queries.